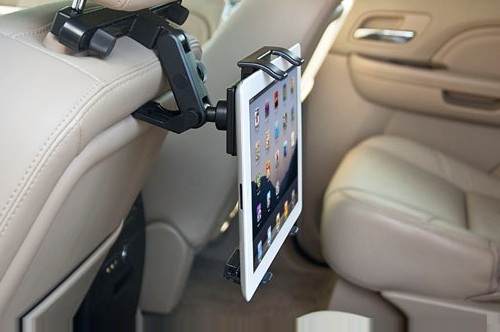 The Universal Tablet Headrest Mount is the ideal rear seat accessory for mounting your iPad or tablet for backseat passenger use when you're on the go. The portable mount securely holds your device for easy viewing and interaction on the road. The mount can be easily removed and stowed or taken with you for use in another vehicle. Price: $19.76 & eligible for FREE Super Saver Shipping on orders over $25.